Sr Mudita Sodder RSCJ; well wisher and regular contributor to SILENT VOICE, has sent another couple of articles, related to Triduum Services, in Bihar and celebration of Bihar Diwaas, where she is stationed. Sharing the same with our readers. SILENT VOICE is grateful to her, and wishes her a good health. May the Risen Christ stand by her to guide her and guide her. Visited the Archbishop this morning; told him about the beautiful Triduum services. Asked me to write it down for him; sending it to you. Rites and rituals are impregnated with meaning. For every human society, life itself is a celebration of giving meaning to different events of human existence as people encounter changes in their own lives and in the environment around them. For centuries different cultures have experienced life in different ways and these experiences are stored in different rituals, myths and symbols. In order to be alive and active, a culture has to relive its experiences. This means that the experiences stored in rituals are to be enacted, myths recited, narratives told and retold and events of importance celebrated. These enactments, recitals, tellings and performances transform and enable the people involved to experience the heritage of their culture. Life consists of re-tellings. Holy Week services at Sacred Heart Church, Patliputra, Patna, Bihar were celebrated with a difference! Palm Sunday was enacted with a palm waving procession symbolically welcoming and joining the Lord Jesus in His entry into Jerusalem sitting on a donkey, a symbol of humility, while the readings for the occasion were done in parts. On Maundy Thursday amidst the ambience of a well decorated dinner table, thanks to the Ursuline sisters and 7 concelebrants, Fr Devasia the Vicar General of Patna Diocese, the main celebrant, helped by 5 parish Youth (girls) washed the feet of 12 Parish Youth (boys) representing the 12 disciples of Jesus. The message of Servant Leadership and Inclusiveness were thus portrayed and proclaimed loudly and clearly! Parishioner Charles and Mavis Peter later took the 12 disciples to their home to share a sumptuous fellowship meal around the table, while the Religious of the Parish partook of the home-made unleavened bread, symbolic of oneness, bonding and working for the common Kingdom of God! The parish unitedly took turns to sit around the altar of repose, commemorating the watch with Jesus as he sweated drops of blood in the garden of Gethsemane. The whole service was a day to remember and a lesson in community building! Good Friday began with a Blood Donation Camp in the morning organized by the Catholic Kalyan Samiti under the leadership of parishioners Raymond Osta and Prakash Cherubim, a lesson in Participative Church. 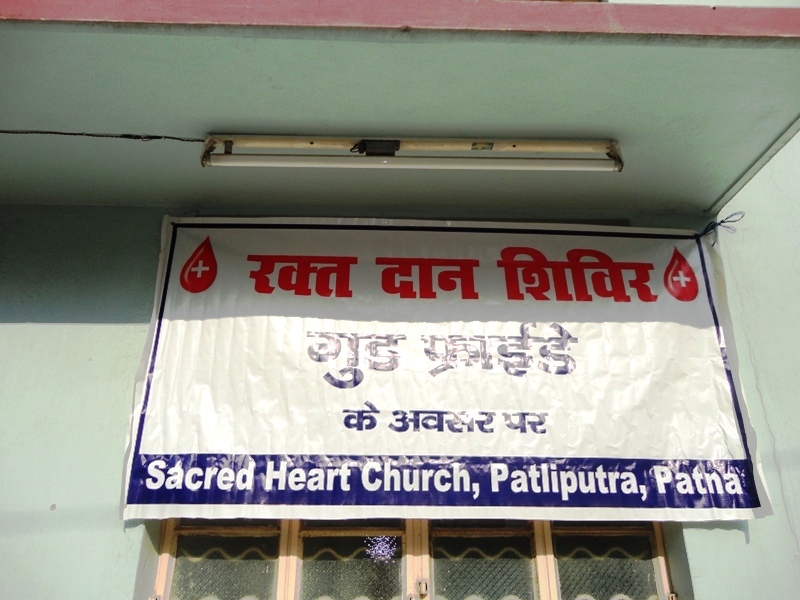 Parishioner Mukul opined, “Donating just one unit of blood for another is only a minuscule way of identifying with Jesus who gave every drop of His blood for us”. “The Holy Family Hospital Blood Bank personnel tested my haemoglobin and found it low. I am not worthy to identify with Jesus. They could not take my blood but I get a lot of devotion and I am inspired by all those who eagerly and willing give their blood”, said Sr Wineeta UMI. The alleys in front of the Church were all cleaned and watered and well-marked with lime for the Way of the Cross at 3.00 p.m. 14 parishioners have been given pictures of the Stations of the Cross which they have framed and use every year. 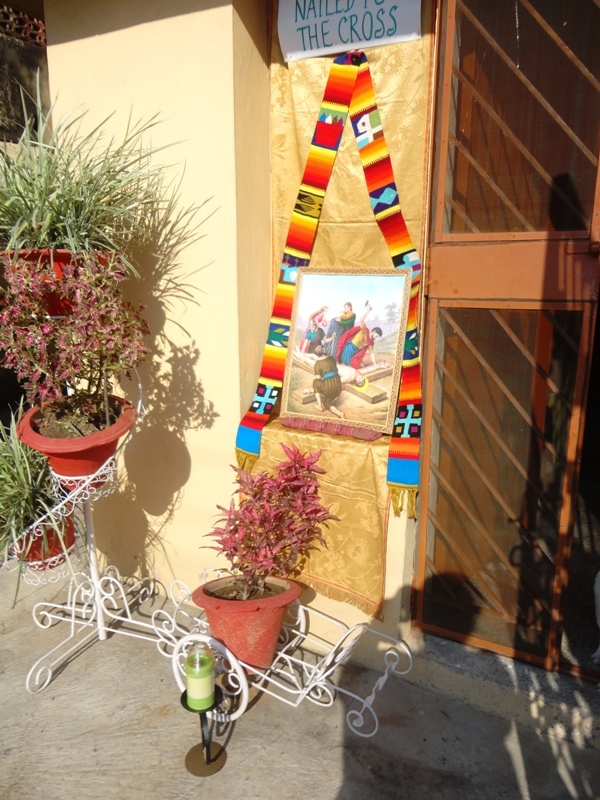 Each house or group painstakingly put up an altar outside their homes to display the picture of the allotted Station of the Cross. All assembled in the basement of Kedarkunj-the high rise building, to begin the service enacted with the life sized cross carried by the 75 year old Parish priest Fr Devasia who almost succumbed under its weight and other parishioners in turn, together with banners, crosses, mikes, loudspeakers, singing and chanting by all. The huge procession stopped at every altar welling up devotion among the people, as passers-by and others rushed out on to their balconies to witness the scene. What a beautiful and practical way of evangelizing! The church was filled to capacity as devotees bellowed out with full throated voices and “bhakti” the commonly sung hymns. Everything was in Hindi-the national language, lessons in Inculturation, Patriotism and Nationalism. The cross was reverentially unveiled by Fr Devasia VG who used his God-given talent of music, for mission. The day’s fasting was joyfully broken after the Communion service at 5.30 p.m. with a soft drink for all, generously donated by parishioner Remy Osta amidst much camaraderie, a model of a true Christian community. Holy Saturday is a day of quiet and prayer. 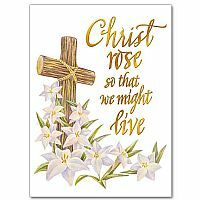 Easter Vigil Mass begins on Saturday night and the celebrations culminate with Easter Sunday which is the biggest, most important and meaningful religious festival of Christians all over the world. All this, would not be possible, if it were not for the dynamic, retired, veteran Parish Priest Fr Devasia-a lesson in the Power of One. One person can make a difference and bring about change. Christians are an Easter people and Alleluia is our name. May the joy of the Resurrected Christ inundate the hearts and minds of all around. Happy Easter! Bihar Diwas 101st Celebrations from 22nd to 24th March 2013 with “Women Empowerment” as its theme this year was an excellent idea to instil a sense of Bihari pride and to exhort people to work hard to regain the state’s rich cultural heritage and past historic glory. A lot of precious time, energy and public money was spent, as the Pavilions at Gandhi Maidan were aesthetically and exquisitely done. Kudos to Mr Nitish Kumar our CM and his team! What pained me, when I visited the venue on Saturday 23rd March between 11.00 a.m. and 3.00 p.m. was the scanty trickle of people, disproportionate to the wonderful exhibits, and the heap of broken plastic chairs, the result of the unruly crowd the previous evening. What appalled me further was the lack of sensitivity on the part of the organisers (especially Mr Deepak Kumar Singh, Principal Secretary, Environment and Forest Department) to Dharti Maa! All the volunteers were served a sumptuous lunch in smart neatly packed thermocol trays. My heart bled. This is our state. We live in it. Thermocol is non-biodegradable. The manufacture of thermocol releases harmful Chloro Fluoro Carbons (CFCs) into the atmosphere, increasing the hole in the ozone layer, inviting dangerous Ultra Violet Rays into our Planet and adding to Global Warming! Can we afford to do this to our Mother when she is the focus of our celebrations? WHY DID I BECOME ONE AMONG YOU ?? Truth Is Available Only To Those Who Have The Courage To Question, What Ever They Were Taught.! EASTER Is A Joyous Occasion And The Biggest Feast In The Christian Calendar. to provide you with nothing other than the best informative article rather than the hypothetical. Sometimes Our Role As A Writer Is Not To Say What We All Can Say, But What We Are Unable To Say.! Through 6 categories’. & 112 Tags. We never give up though with tired hearts, but acknowledge your responses for which we worked. We intend providing you henceforth, True Value Articles on Mercurial Moments, before they becomes a Memory. Not to be the One’s that will say we Can’t,! or We Won’t.! The religious meaning of Holy Week. 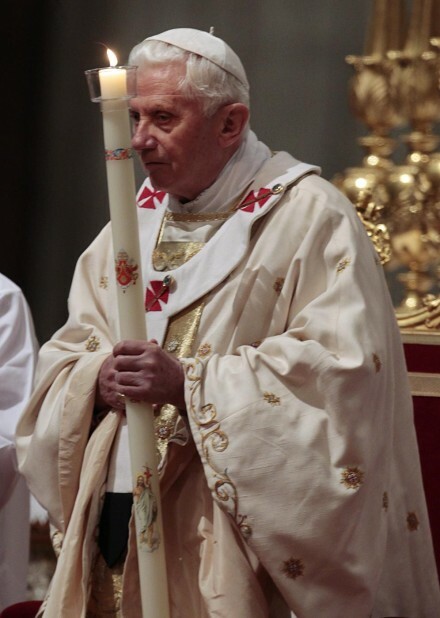 Pope Benedict XVI, at Eastewr Vigil. It was 1948, at one of the first Easter Vigil services in Europe. The darkened Church was a fairyland of flickering candlelight from the hands of each member of the assembled congregation. The celebrant had just intoned for the third time, “Lumen Christi” (Light of Christ) and the congregation had responded “Deo Gratias” (Thanks be to God). He placed the Paschal Candle representing Christ the Light on the candle stand in the sanctuary and opened the Missal to sing the most beautiful, poetic hymn of the Church’s Easter liturgy, the Exultet (Rejoice All You People). The lights came on like a blinding explosion, illuminating the entire Church. Suddenly the celebrant, 62-year-old German Benedictine monk Odo Casel, crumbled to the floor. Before any help could reach him, he died of a massive heart attack. The culmination of his life’s work was initiating the Easter Vigil liturgy in the Catholic Church. He had struggled for years against misunderstandings and suspicions about his orthodoxy. But on that unique Easter Vigil night, his lifelong dream had been fulfilled. The pristine beauty of the religious meaning of Holy Week was restored to the Catholic Church, under the symbols of the liturgical celebration. The Easter Vigil is like the clashing of the cymbals of Holy Week, while beginning with Palm Sunday, and through Holy Thursday and Good Friday, the liturgical events are like the drum-roll leading up to the crescendo of Easter Sunday. Holy Week celebrates the religious significance of the foundational Christian mystery: the Death and Resurrection of Jesus Christ. Palm Sunday, also called Passion Sunday because of the reading of the whole Passion of Jesus account from one of the Gospels, is the initiation into the pathos – the joy and sorrow – of Holy Week. The whole Passion account is read, so that we, who were not present during the historical happening, may participate in the saving power of that event today. It celebrates the triumphal entry of Jesus into Jerusalem. He comes not as an arrogant, warring monarch riding on a horse, but as a humble sovereign, bringing the Good News of peace and riding on a donkey. The Gospel each Palm Sunday narrates how within a few days, the very people who hailed him as their king turned against him, condemning him to the intense humiliation, suffering and cruel death on the cross like an ordinary criminal. Holy Thursday celebrates the joy and sorrow of Jesus’ last will and testament of love for his friends. He washed their feet, doing the job of a servant, thus leaving them an example of humble service to be followed by those in authority in the Church. The very purpose of authority is to serve, not with arrogant power, but as a profound privilege. Jesus then institutes two sacraments – the Eucharist (thanksgiving meal) and the priesthood – so that his challenging, living memory of sacrifice and service may be shared and continued within his family the Church. Then comes the poignancy of Good Friday; the sorrow of his agony in the Garden of Gethsemane; of his betrayal by one of his closest associates Judas; his denial by another, Peter; and his abandonment by all the rest for fear of the Jews. He is taken prisoner, made to suffer intensely and die ignominiously on the cross for the salvation of the whole world. Good Friday celebrates Jesus’ revealing God’s unconditional, everlasting love for us. The Easter Vigil is like the overture to the cataclysmic climax of the Resurrection event on Easter Sunday. It is the culmination of Christian faith that Jesus rose from the tomb. This is not a mere resuscitation from death like Lazarus, but a dramatic transformation to a new and everlasting life. Therefore those who share in Christ’s sufferings here and now, also share in the certainty of his resurrection, receiving a fresh transfusion of his eternal life and a share in his victory over the power of sin and evil of every kind. While we grapple with the need to interweave liturgical celebration, authentic doctrine and daily life, we remain indebted to Odo Casel for retrieving an invaluable, pristine heritage of the integral Holy Week faith significance, the Paschal Mystery. Redemptorist Father Desmond de Souza formerly served as the executive secretary of the Office of Human Development in the Federation of Asian Bishops’ Conference. He was closely associated with the Churches in Asia from 1980 to 2000. He is now based in Goa. Hundreds of devotees from the surrounding villages are expected to throng to Old Goa to witness the procession. On the occasion of Good Friday, Archbishop Filipe Neri Ferrao of Goa will today lead a unique procession leading to the Se Cathedral, where the services will commence. Hundreds of devotees from the surrounding villages are expected to throng to Old Goa to witness the procession, popularly known at ‘Xempdeanchem Pursanv’. 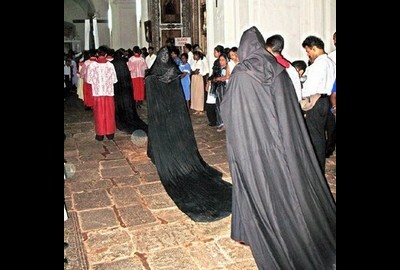 Six canons attired in black robes, faces covered and with tails attached behind their robes, participate in this procession in which the life-sized statue of Jesus laid in the coffin is carried on the shoulders by members of the confraria. According to canon Fr. 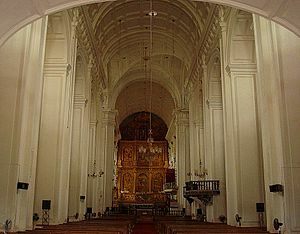 Saturnino Dias, ‘Xempdeanchem Pursanv’ dates back to the year 1534, when Pope Paul III raised the former church to the status of Se Cathedral. 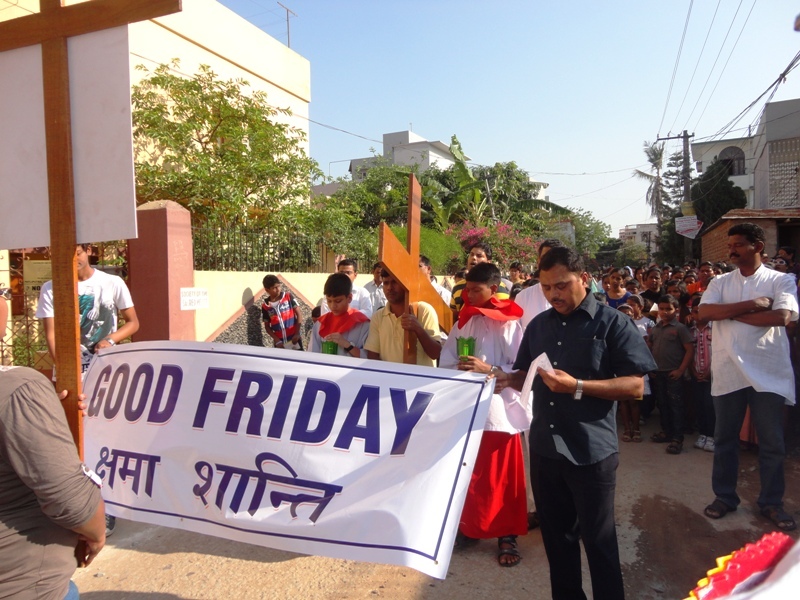 “Goa is the only place in the world after Rome where such a procession is held on Good Friday,” said Dias. Presently based at the Se Cathedral, Dias is the former secretary of the Catholic Bishops Conference of India (CBCI) and executive secretary of the Evangelization Federation of Asian Bishops Conference. We, in Archdiocese of Bombay, are facing similar situation. In the name of Development. Our Churches are being targeted and being served with Land Acquisition Notices, unjustly. Opposition to this unjust land grab by authorities is being termed as opposition to developments. As the report states, around Hundred Churches will be submerged under water, once the dam is built, which will then vanish into oblivian. Nearer home, we have a history of one very ancient Church known as Church of Our Lady of Ampar, which is submerged in the belly of VIHAR LAKE. 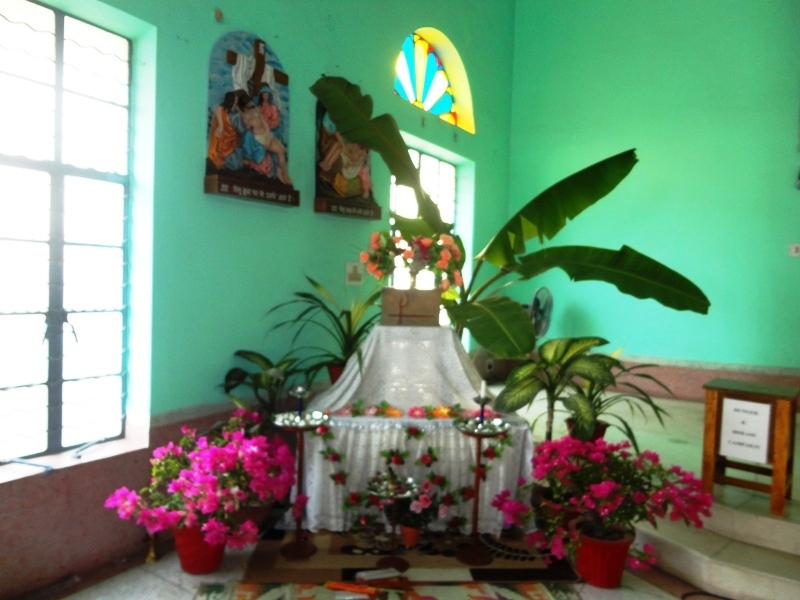 Statue of Our Lady was shifted to St. John Church, Marol. Christian population has, as we all know, always become a soft target in the name of development. SILENT VOICE condemns these actions of powers that be. 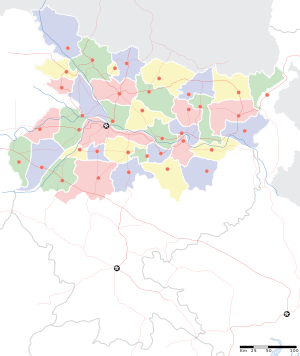 They claimed the project might trigger ethnic conflict between the two districts. 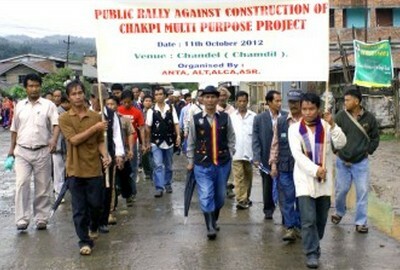 Christian groups in Manipur’s Chandel district have submitted a memorandum to Prime Minister Manmohan Singh on March 25 seeking his intervention to stop a proposed multi-purpose project in Chakpikarong area. Members of 27 Christian denominations jointly said in the memorandum that the proposed “Chakpi Multipurpose Project” which includes a dam threatens to submerge 100 churches. Moreover, the project threatens to submerge several villages, adversely affecting the total population of some 122,700 people in an area of 3,313 square kilometers. They accused the state government of pushing the projects without considering the ill effects of it on the local population. The project’s main aim is to divert the water from Chakpi River and irrigate 9,495 hectares in Thoubal District to facilitate multiple cropping and improve the economic life of its people. 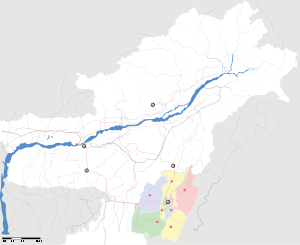 But the project is designed at the cost of indigenous tribal people and their land in Chandel district, and it might trigger ethnic conflict between the two districts, the memorandum said. The government estimates some 26,000 workers may come for project and this influx of non-indigenous workers is a “grave danger” for the local people, the memorandum said. The influx may lead to minority tribal people “losing their culture, custom, religious and unique way of life through mixed marriages, acculturation and assimilation,” it said.